We’d love your help. Let us know what’s wrong with this preview of A Century Is Not Enough by Sourav Ganguly. Sourav Ganguly's life has been full of highs and lows. Arguably India's greatest cricket captain, he gave confidence to the team, re-energized them and took India, for the first time, to spectacular overseas victories. But Ganguly's story also came with great challenges - from his early days where he had to wait four long years before being included in the team to the ugly Sourav Ganguly's life has been full of highs and lows. Arguably India's greatest cricket captain, he gave confidence to the team, re-energized them and took India, for the first time, to spectacular overseas victories. But Ganguly's story also came with great challenges - from his early days where he had to wait four long years before being included in the team to the ugly battle with the Australian coach Greg Chappell. He fought his way out of every corner and climbed back up from every defeat, becoming India's ultimate comeback king. To ask other readers questions about A Century Is Not Enough, please sign up. An unstructured, ordinarily written, patchy and disappointing read. I won’t say I had high expectations from Sourav Ganguly’s autobiography. Having followed his career minutely and observed him as a cricketer, I knew what the tone of the book would be like. But I was still interested in it as I was once a huge Ganguly fan. Autobiographies of Indian cricketers haven’t really been great of late, including Sachin Tendulkar’s ‘Playing It My way’. Despite that, with Ganguly's book, I was expecting some great insights into the mind of a fighter and a leader. Unfortunately, what I got was a mixed bag; mildly good in parts but disappointing overall. What’s worse is that it’s not even well written. More on that later. Sourav Ganguly’s contribution towards Indian cricket is immense. He was one of best ODI batsmen of his time and became a great leader who molded Indian cricket in the right direction during a very tough period. It was under Sourav Ganguly’s leadership that a new, fearless Indian team emerged. But…These are the things I already know about. I didn’t need another book to tell me this. What I wanted to know more was about Sourav Ganguly, the person. I wanted to get a peek of his formative years; his childhood in Kolkata, his school days and how the game caught his fancy. I also wanted a detailed view into his mind as a captain. As a player, Ganguly was aggressive and never shied away from giving it back. But what I got in this book is incessant ramblings of a person who thinks he was wronged through most of his career and the world was out to get him. That he was the eternal victim who did everything right. Always. Ganguly starts with his last day in international cricket – at Nagpur against Australia, 2008. From there we move on straight to his first ODI match in 1992. The chapter on his debut tour in Australia is interesting and it is the only one where he accepts his flaws and sacking gracefully. We then move straightaway to his memorable debut Test match at Lord’s against England in 1996. There is hardly any mention of what Ganguly did in the intervening years and how he prepared himself mentally with the failure. And like I said, there is no mention of his boyhood cricket-playing days which I feel is a huge miss. From there on, Ganguly reflects on the well-known events of his career – his performance against Pakistan at Toronto in 1997, his 183 against Sri Lanka in the 1999 World Cup, his elevation to captaincy, the 2001 Eden Test against Australia and the 2002 Natwest Tri-series win against England. All these events are glossed over, punctuated with some anecdote here and there. I was incredibly disappointed that the 2001 Test series against Australia and the 2003 World Cup in South Africa – Ganguly’s biggest moments as a captain – are finished in a few paras. Hell, the 2001 Eden Test itself, with all its remarkable ebbs and flows, deserved a separate chapter. It’s a cardinal omission, in my view! After this, there are pages upon pages on his strained equations with Australian coach Greg Chappell and how he was this evil monster. Ganguly goes on to highlight how Greg was ‘out to get him’ along with a few selectors. In fact, during the second half of the book it felt like the motive behind writing this book was to call out all those who had wronged him. Throughout the book, Ganguly frequently projects himself as the victim and overglorifies his feats as a captain and batsman while completely overlooking his deficiencies. For instance, he claims that the 2004 Test series victory in Pakistan was his biggest moment as a captain but casually ignores to mention the fact that Rahul Dravid was the stand-in captain in one of the Tests. He takes great pride in talking about his hundreds scored against Wasim Akram and Glen McGrath, as he should. But then, when he talks loftily about the drawn series against Australia in 2004, he fails to state that it didn’t feature the likes of Glen McGrath and Shane Warne in it. Shockingly, Ganguly completely ignores talking about the 2004 home Test series loss to Australia. How can his memoir exclude such an important event in his tenure? Also, while Ganguly rambles on for pages about his sudden removal from the Indian team, he never, for once, mentions the poor form he had prior to that phase or at any point in his career. He brags about his hundred against Zimbabwe in 2005 before he was dropped, but never talks about the fact that he had scores of 21, 12, 12, 1 and 2 prior to that innings. In fact, Ganguly also states how he was literally ‘forced’ to appear for an advertisement for Pepsi after his removal from the side where he had to say the lines ‘Mera Naam Sourav Ganguly. Bhule Toh Nahi?” For a man of Ganguly’s aggressive and no-nonsense nature, I find it hard to believe that anyone could twist his arms to do something he wasn’t at all interested in and was, in fact, embarrassed by. Also missing are any talks about Ganguly’s technical deficiencies that he faced through his career. I was really keen on reading about his frailties against the short ball and his issues on the leg-side. Surely, talking about how he struggled against them and how he managed these chinks in his batting would have only made him appear like a normal sportsperson. Sanjay Manjerakar’s ‘Imperfect’ was much better that way. At least Sanjay was candid enough to accept his personal and technical flaws in his memoir. With Ganguly, we do not get any of that. Another issue that bugged me all through the book was the barrage of motivational nuggets he keeps on piling for the readers. And in doing so, Ganguly often produces a motivational story from tales of his wistful struggles and several magnified triumphs in his career. Some of his episodes of struggles were genuine and did serve as an inspiration in itself. But when he followed them up with quotes like “Take the danger head on and never give up” they kind of lost the taste. Surprisingly, even though the book is co-authored by a senior journalist, it isn’t well written either and there is not a single sentence that I was impressed with in the way it was framed - they are all very mundane and ordinary. It is also riddled with numerous typographical and punctuation errors. A proper quality check was really needed in this one. What I felt after finishing the book was that Ganguly was on this ego trip. He was one of the most influential cricketers of his time and could have presented an engaging and absorbing view of his life and career and, more importantly, of one of the most consequential phases of Indian cricket through his prism. But that opportunity is squandered as Ganguly disappoints with an overkill of a vainglorious look of himself. I have a feeling that this book was written in a rush, much like Sachin Tendulkar’s ‘Playing It My way’. It appears that Ganguly sat down and chalked out all the things about himself that would present him as a victim and an unrelenting champion, while conveniently ignored some of the more uncomfortable aspects of his career. And that is where this autobiography is incomplete and patchy, while also being unstructured and ordinarily written as a whole. Ganguly was a fascinating character and people loved him even with his flaws. No one can take away all that he has achieved for Indian cricket. However, I didn’t want a repeat of all the well-known tales about him. I wanted a sincere account of his life and career. 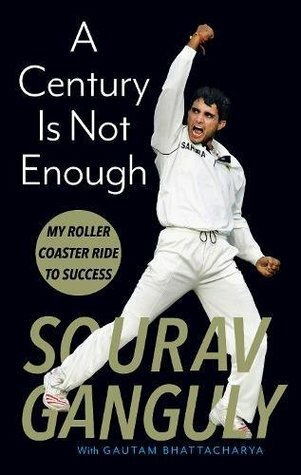 While definitely a better read than Sachin’s book, ‘A Century is Not Enough’ left me feeling rather displeased. Another Indian cricket legend's autobiography, and another wikipedia-ish pile of what-you-already-know-too-well. Sourav Ganguly's A Century is not enough falls flat on its face. Especially given how Ganguly was known for being in your face. Large swathes of the book read like self-help sessions that are going around in circles, while the cricketing part, and the little that surrounds it, is without substance. The book centres mostly around the struggles Ganguly faced during his 18 year cricketin Another Indian cricket legend's autobiography, and another wikipedia-ish pile of what-you-already-know-too-well. At the outset, this book was purely picked up by me because I am a crazy supporter of Dada.. I use the word supporter because I always used to believe that he deserved to make a come back and treated better than the way he was treated by people around him. This book is really well written. You can see that the support author has kept his role to a minimal, which is not what I felt when I read Sachin’s autobiography. The book not just makes you relive some of the glorious moments in Indian cricket history during the late 90s and 2000s ( golden period) but is a treasure trove on leadership. The best part is it does not portray Dada as some flawless larger than life captain but a guy who went through a lot as a captain and shows how much work goes into being a leader of men. I would refer this book to anybody who wants to learn about leadership and how leaders are not just born but are made through self learning and self sacrifice. Dada is the architect of what we are today as a cricket team. Dada influenced the way my generation looked at life, we saw him being aggressive and winning and we realised we could do it too. Don’t forget, he had this influence because ,during his career, cricket was the one and all there was in terms of sports in India. And sports does build a generation. Thank you Dada for your service to the game and the endless smiles you brought us!! A great read for Cricket and Sourav Ganguly Fans.. His Nostalgic memoir will take you down a memory lane.. Remind you of all those wins and losses you shared with your family and friends.. The book is an uputdownable page turner.. The writing is frank, conversational and engaging.. Sourav Ganguly has written without mincing his words.. He has shared some chuckle-worthy anecdotes from dressing room.. In short, Indian Cricket Fans shouldn't miss it.. I was really looking forward to Ganguly’s autobiography. And what a coincidence, I read it just after Manjrekar’s autobiography whose exit coincided exactly with Ganguly’s entry. I started watching cricket in 1991 with SAF’s re-entry into world cricket and India’s disastrous tour of Australia. We were terrible away from home and an away test win (even in Zim) was beyond imagination. Infact even at home, we used to host top teams once a decade on rank turners. And also, very frustratingly, our rec I was really looking forward to Ganguly’s autobiography. And what a coincidence, I read it just after Manjrekar’s autobiography whose exit coincided exactly with Ganguly’s entry. I started watching cricket in 1991 with SAF’s re-entry into world cricket and India’s disastrous tour of Australia. We were terrible away from home and an away test win (even in Zim) was beyond imagination. Infact even at home, we used to host top teams once a decade on rank turners. And also, very frustratingly, our record against Pak in ODIs was pathetic. With Ganguly’s debut and then his captaincy things began to change. It is almost as if he forged a team from his sheer will and resilience. In this book he recalls his rise and early days in international cricket. And the last section in which his struggles with coach Chappell have been noted was very interesting esp since there was a lot to know. 'Çonfidence is the only cologne you can wear in the dressing room', 'Darkness always has an expiry date' are some of the Dada-isms that stayed with me at the end of this book. There is a lot of motivational stuff here -- especially for those looking at making at comebacks, not just on the field, but also in life. Some of it is very generic, and some quite contextual. A Century is Not Enough is a quick read -- covers a large part of Ganguly's career, especially the important developments in his vi 'Çonfidence is the only cologne you can wear in the dressing room', 'Darkness always has an expiry date' are some of the Dada-isms that stayed with me at the end of this book. There is a lot of motivational stuff here -- especially for those looking at making at comebacks, not just on the field, but also in life. Some of it is very generic, and some quite contextual. A Century is Not Enough is a quick read -- covers a large part of Ganguly's career, especially the important developments in his view -- his selection, being dropped from the side and from captaincy, his comeback, retirement, IPL and of course, Greg Chappell. I am fairly satisfied with what he's shared about all these topics -- although I wanted a lot more fireworks between him and Greg, about what REALLY happened. Sourav Ganguly - "Prince of Kolkata"(in Geoff Boycott's accent) , Sourav "Man of the match Ganguly", "Maharaj" , The ultimate comeback King, "God on the offside"- Dada could give Apollo Creed a run for his money when it comes to the number of names he was known by. For me, he was quite simply the best Indian Captain ever who instilled a winning mentality , self belief and killer instinct into the team. The book is exactly what I expected it to be - Straightforward, insightful, unforgiving and mo Sourav Ganguly - "Prince of Kolkata"(in Geoff Boycott's accent) , Sourav "Man of the match Ganguly", "Maharaj" , The ultimate comeback King, "God on the offside"- Dada could give Apollo Creed a run for his money when it comes to the number of names he was known by. For me, he was quite simply the best Indian Captain ever who instilled a winning mentality , self belief and killer instinct into the team. The book is exactly what I expected it to be - Straightforward, insightful, unforgiving and most importantly a superbly paced quick read. And unlike Tendulkar (who remains my favourite in terms of pure cricketing genius), Dada does not mince any words and there are no half measures. My only complaint is that the book was too short! But then, it is targeted at a much wider audience majority of whom may not be receptive to a marathon read. Okay. I, much like a lot of other people, am a self-professed uber fan of Sourav Ganguly. And the fan in me wanted to give a 5-star rating to this book; the avid reader (again, self-professed) in me, a 3. The haggler in me has settled for a 4. The goods? It is Sourav Ganguly's memoir of his professional career. The highs, the lows, the good, bad and ugly. It is all here. An illustrious career played out in constant media glare is recounted in vivid detail, replete with the great man's thinking at Okay. I, much like a lot of other people, am a self-professed uber fan of Sourav Ganguly. And the fan in me wanted to give a 5-star rating to this book; the avid reader (again, self-professed) in me, a 3. The haggler in me has settled for a 4. The goods? It is Sourav Ganguly's memoir of his professional career. The highs, the lows, the good, bad and ugly. It is all here. An illustrious career played out in constant media glare is recounted in vivid detail, replete with the great man's thinking at various points in his life. Nigh-religious fans, like yours truly, would definitely derive pleasure in reliving the highlights of Dada's career while also understanding just now, what his mindset was when he was creating those memories for us. Through this book, we get a peek into the mind of a champion athlete. There is a certain arrogance in the writing at times, a bit of victim-hood at the others, but a general, constant pride in his life's work. It has quintessential traits of the Sourav Ganguly persona, at least the public one, that we all have loved for so long. The downfalls? This is a book which has quintessential traits of the Sourav Ganguly persona. The reference to himself in the third person, the sense of self-righteousness at all times, the attempt to create an infallible image for himself, and the constant bits of motivational advice either break the flow or just make for a laborious read at times. I don't know why this memoir was written, maybe some propaganda issues...This book is far from honesty and truth.I don't want to continue this review, my cholesterol level is quite high right now after reading this book.Period. 1. Pathbreaking captain : He tried out new things like getting a foreign coach for the first time in Indian cricket. First captain to do a recce of a foreign country (Australia) to understand pitches and ground conditions before an upcoming tour. 2. Inspiring leader: Most of the players he captained also vouch for this aspect of his personality. He successfully set foundations of a side which would do really well later. 3. Egoist: This bit is quite fascinating. He only talks about his successes in the book. Cherry picks and remembers good knocks in his defense of not getting picked in the squad and in general is quite defensive around performance. I would have liked Ganguly to write a more humble and candid assessment of his own career. A quick read whose central theme can pretty much be summed up as 'Never give up, no matter what'. The book however fell slightly below my expectations in that it hardly gave the time to dwell enough on any of the goosebumpy incidents, be it the era defining Kolkata test, the Natwest Trophy final, the 2003 World Cup run, the Adelaide test... The memoir was more about how Ganguly always had to fight for his place, for his players, for proving himself repeatedly, and how the various setbacks he fac A quick read whose central theme can pretty much be summed up as 'Never give up, no matter what'. The book however fell slightly below my expectations in that it hardly gave the time to dwell enough on any of the goosebumpy incidents, be it the era defining Kolkata test, the Natwest Trophy final, the 2003 World Cup run, the Adelaide test... The memoir was more about how Ganguly always had to fight for his place, for his players, for proving himself repeatedly, and how the various setbacks he faced eventually made him determined and stronger. Having led India for five years, I was hoping to have more glimpses into what was going on inside Ganguly's head and the dressing room when the Indian team staged some of the brilliant comebacks mentioned above. He did repeatedly mention some of his captaincy mantra; supporting a player to the hilt, giving them ample opportunities to excel without the pressure of being dropped hanging over their heads and the nugget that it's more self-belief than skill that sometimes makes the difference in overseas tests and how he aimed to correct it by adopting an aggressive attitude and exhorting his players to do the same. This book is purely fa cricket fans, others don’t give a try. Dada talked only Abu the life b/w the 22 yards. It’s seriously emotionally draining at times to read the kinda hardships he went through to break the cricket politics & stage a come back. Nothing came easily on the plate of king of comebacks. From Indian captain to go a downhill in life & treated as an ordinary player who need to score runs in Ranji Trophies to impress selectors shows everything is temporary in life. A big sal This book is purely fa cricket fans, others don’t give a try. Dada talked only Abu the life b/w the 22 yards. It’s seriously emotionally draining at times to read the kinda hardships he went through to break the cricket politics & stage a come back. Nothing came easily on the plate of king of comebacks. From Indian captain to go a downhill in life & treated as an ordinary player who need to score runs in Ranji Trophies to impress selectors shows everything is temporary in life. A big salute & respect fa the fighting spirit he shown. My hate list name always includes Chappel, after reading this book, it holds the second place after Hitler 😛. One small disappointment i feel is Saurav didn’t talked abu his fan enough. Kinda of fans he had during his tough time was surreal, he is the one cricketer in my childhood , who had committed crazy fans fa his attitude more than batting, he should have thanked them & talked Abu them more. A book by the great indian cricketer describing his journey from his debut for india to leading the team to world cup final, from a nationwide loved cricketer to being excluded from the team even after scoring huge runs. This book not only tells the story of Sourav ganguly's career but also tries to give important life lessons to the readers in a way that the reader is always engrossed in the book and the book might also help him in his life in some way. This was a great read, i totally loved rea A book by the great indian cricketer describing his journey from his debut for india to leading the team to world cup final, from a nationwide loved cricketer to being excluded from the team even after scoring huge runs. I was really looking forward to read uncensored account of life events of my childhood hero, and this book left me wanting for more. I wish it had some more inside events of his life but it turned out very generic. Still it was a thoroughly enjoyable read which took me down the memory lane and strike that chord of nostalgia with rewinding to all those golden days of Indian Cricket. Four Stars just or the love of Dada!! The book gives a peep into the mind of Sourav the cricketer. It's all about who were with him in his journey and who were against. It mostly touches upon his individual contributions and does not talk about Indian cricket as a whole. Read it if you love the man, but ignore if you don't care. The good parts of the book are the feelings Ganguly shares along the way, the feeling of being selected for the India team for the first time, the shy, vulnerable Ganguly with the feelings of anxiety, the A good read overall (4.5 maybe). Towards the last couple of chapters I sort of found it a bit boring but completed the book nonetheless. If you have followed Ganguly, you will find this a very Ganguly-esque book. You will actually visualise Ganguly saying these in an interview. Its that close. The Book is very engrossing and easy to read. However, for a cricket fan there is not much written in the book which was not already public. The book gives some important lessons on how to deal with rejection and come back. Very very disappointing. This is yet another mediocre biography, in the ‘lets-compile-a-chronological-narrative-around-the-playing-career’ format masquerading as an autobiography. The Sachin autobiography was also in a similar format, but I expected Sourav’s to be a lot more insightful and engaging. Unfortunately, it looks like little effort or insight from the player went into it beyond providing the facts and some anecdotes. (1) I could finish the book Very very disappointing. This is yet another mediocre biography, in the ‘lets-compile-a-chronological-narrative-around-the-playing-career’ format masquerading as an autobiography. This is not just a memoir but also a self-help guide book. In almost every page, Sourav has tried to inspire his readers by sharing his own life's experiences. While starting to read, i thought of highlighting the lines with a marker, which i felt would inspire me in future, when i will be going through a bad phase. After finishing reading few pages, i realized that i would end up highlighting almost the entire book. There is no denying or its not any secret that Sourav is considered as destiny's This is not just a memoir but also a self-help guide book. In almost every page, Sourav has tried to inspire his readers by sharing his own life's experiences. While starting to read, i thought of highlighting the lines with a marker, which i felt would inspire me in future, when i will be going through a bad phase. After finishing reading few pages, i realized that i would end up highlighting almost the entire book. There is no denying or its not any secret that Sourav is considered as destiny's child; he is seen as the sportsperson who has come back from ashes again n again. Some might relate this book with his own batting style - aggressive and defensive at the same time. But that is how he has led his entire sporting career. Even in his haydays he had to defend and prove his skills time n again. One thing which strongly comes out from the pages is the anger Sourav had for his detractors. And since he had many, the approach is quite expected considering that its a memoir written directly by him. In my opinion, more than the anger its the frustration which he faced with individuals - The disappointment of having to prove his credibility even till his last day of playing. There are segments where Sourav has boasted about his achievements, but that is expected again if someone has to remind people that he has been one of the very few leaders, a general who changed how Indian cricketers looked into opponents eyes. Overall, anybody who has followed Indian Cricket of Golden times, when the lineup looked like Tendulkar, Ganguly, Dravid, Laxman, Kumble, Sehwag, Yuvraj, Harbhajan, Srinath, Zaheer would find this book very touching. Pick it up without batting an eyelid. A natural point of comparison is Tendulkar's autobiography 'Playing It My Way', which is the 2007 World Cup of autobiographies (the 2007 World Cup sucked). In comparison, Dada's work is frank, conversational, and a deeply personal glimpse into one of India's most complex minds. I give it 4 stars because of the squandered potential - The occasionally clunky writing and the unnecessary urge to race through important events rather than flesh them out a little, makes me hope that in the years to com A natural point of comparison is Tendulkar's autobiography 'Playing It My Way', which is the 2007 World Cup of autobiographies (the 2007 World Cup sucked). In comparison, Dada's work is frank, conversational, and a deeply personal glimpse into one of India's most complex minds. A good book and an easy read. But there are so many gaps in the narration. The focus is primarily on the many crises that Dada had in his career. The book is also motivational. However do not pick up this one hoping to get a comprehensive look into the legend's life, professional and personal. A really enjoyable book, the autobiography of one of my most favourite cricketers and arguably the greatest captain Indian team has ever had. I finished reading this book in less than a week. It felt like a flashback of sorts as it took me back to the time when I was very passionate about cricket. If you loved the Indian cricket team of the 1990s and the 2000s, then you'll love this autobiography of Sourav Ganguly. This was one autobiography that I have been waiting for a long time - not only as a fan but for the tumultuous and eventful career that Dada had. Right from the forgettable debut in Australia, his career had always been under scrutiny and experienced peaks & throughs like no one else's. And controversies abounded. That's what he focuses on in this componentized autobiography, which covers the major chapters (debut, Lord's, Toronto, captaincy, Natwest, Australia rivalry, Greg Chappell, the ep This was one autobiography that I have been waiting for a long time - not only as a fan but for the tumultuous and eventful career that Dada had. Right from the forgettable debut in Australia, his career had always been under scrutiny and experienced peaks & throughs like no one else's. And controversies abounded. That's what he focuses on in this componentized autobiography, which covers the major chapters (debut, Lord's, Toronto, captaincy, Natwest, Australia rivalry, Greg Chappell, the epic comeback, IPL) in his career rather than his entire life. And he does it bare it all - from the exact happenings, to the rumors that abounded, and how he went through the motions.